It's not uncommon for a gamer to spend a lazy Sunday afternoon playing Call of Duty or Battlefield from the couch, but how often do we take a moment to consider the very real circumstances that military shooters are inspired by? 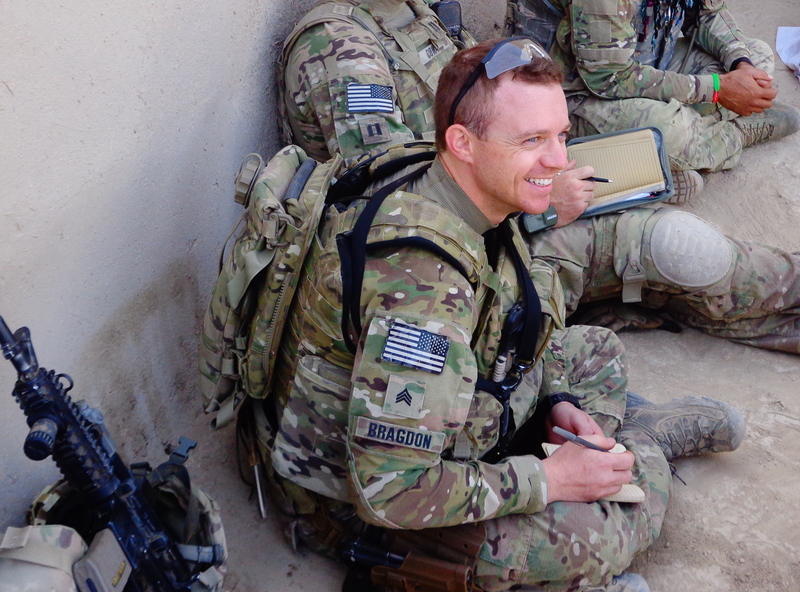 Sergeant Jesse Bragdon is an Escapist community member currently serving overseas in Afghanistan. Known around the site as Phoenix8541, he is 28 years old and the second oldest in a family of 6. He's also happily married and his son will be nearly 2 years old when he returns home from his tour. Recently we had the opportunity to ask him a few questions about himself and his life. When did you first come to The Escapist and what brought you here? I am new to The Escapist, as my past few years have been spent mostly overseas. I try to see what's going on in the RTP area when I can and the new Expo event really caught my eye. I plan to become a member and already have the site as my home page! What is your favorite videogame and why? Double Dragon for NES; Because my mom threw it away when I was younger when she thought it was too violent for my brother and I. Then I joined the Marines in 2003, fought in Iraq twice, dealt with the piracy threat in the Persian gulf, and now I'm taking care of business in Afghanistan. The irony is priceless! Tell us a little about your job. What goes on in a typical day? I am currently working in the Psychological Operations field. My previous work was as a Marine Scout Sniper, a form of psychological warfare in its own right. Although the details of my daily work is not something I can openly discuss, as clichÃ© as it sounds, my primary task is to work with the host nation residents in hopes to better understand how to help them regain security in their villages and cities. We also help to create a stronger sense of understanding between ourselves and the locals, to harbor greater cooperation and lasting effects for current and future projects. Every day I strive to help with everything from the local economy, employment, health issues, cultural differences, and creating chances for the people here to have the opportunity of a future free of fear that we so enjoy in America. Yet life out here does consist of as many normal routines as one can fit in a day. There is a gym, chow hall, USO, and I finally managed to get a PS3 out here to get my Skyrim fix in. What was the last book you read, and was it any good? The C.S. Lewis space trilogy! So many only know him for his work with The Chronicles of Narnia, yet his work in the science fiction fantasy series was one of the best reads I have had in years. Besides his writing style, which is imaginative and detailed, he draws you into a story within our own galaxy that, for its time period, shows true imagination and insight. Out of the Silent Planet, Perelandra, and That Hideous Strength are a must read for those who like adventure, mystery, and space! What are some of your hobbies outside of work and games? I love writing, reading, and art, yet being in the great outdoors is my favorite! Hiking to the perfect spot in the mountains, sitting by a fire and watching the sunset, it's the primal fight of man against nature it's exhilarating and peaceful at the same time. If you had a time machine, what would you use it for? I'm sure it's not the typical answer, but I would like to go back and see the men at the Valley Forge. To simply glimpse the sheer determination, love for country and freedom that would drive them, starving and bloody through the frozen winter with no concept of the impact it would have on the future of the nation. Describe your perfect day. You wake up, now what? My perfect day happens once every year. I wake up on Christmas morning, to a day off from life and walk out to a living room warm with scent of my fireplace and fresh pine. I sit down and plug in my old N64 and start a fresh file on The Legend of Zelda: Ocarina of Time! It's a past time that has included different games in the past, yet still remains a tradition and one of the best days of my year. What is your favorite current Escapist feature and why? My favorite Escapist feature would have to be the "Reviews" section. I don't have the opportunity to get my hands on to many game titles, movies or music out here, so having the chance to read up on the pro's and con's of everything new on the market is important for me. What are some of your hopes for the future? What's next? I had a chance run in with the CEO of Red Storm Entertainment back in 2009, and was invited to tour the new headquarters in RTP. The staff was amazing, to see how much work goes into the creation of these iconic game titles was inspiring. The artistry, creativity, dedication and communication needed to produce a single working game gave me a new appreciation for the medium. When I finish my time with the military I hope to pursue a future in the industry with a focus on game art and design. I feel my leadership, communication skills and ability to bring diverse groups together to share a common goal is something perfected throughout my military career that would be an asset in the gaming industry. So I would like to take this chance to thank all those out there who have brought so many stories and concepts to life for us all to enjoy. Thank you for all your hard work and dedication to make gaming what it is today. From all of us out here on the front lines thanks for your continued support! Are there any creeds that you live by? Creed of the 2nd BN 4th Marines Scout Snipers "Though our presence may not be know, our work will surely be felt...Fear not death for it is your Destiny"